For crispiness, juiciness, and great texture! 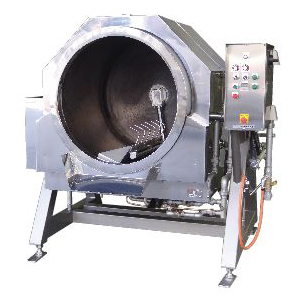 Intermittent stirring and the scraping blade helps to conduct the heat to the ingredients which enables the temperature of the product to rises quickly in short period of time. The revolution speed for the scraping blade and the drum are adjustable depending on what it is producing. Rotating the scraping blade and the drum in the opposite direction increases the number of revolutions which prevents the over cooking. Minimizes the dropping distance which revents the ingredients deforming. The scraping blade can be dismantled with ONE TOUCH, very easily done. There are no burnt left out on the surface of the drum due to the well designed scraping blade therefore very easy to clean. Stir fried noodle, Fried rice, Spaghetti, Rice vermicelli, All other stir fried foods, etc.